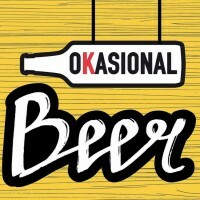 Okasional Beer se constituye con la voluntad de promocionar y ofrecer la cerveza artesanal de compañías españolas e internacionales que se han consolidado en este campo. IPA - Imperial / Double, 8% ABV. IPA en conmemoración a su X Aniversario...! Pale Ale - American, 3.8% ABV. Stout - Imperial / Double, 11.8% ABV. IPA - Session / India Session Ale, 4.7% ABV. Stout - Imperial / Double, 10% ABV. Cerveza artesanal Belgian Strong Golden Ale, 8% ABV. Bock - Doppelbock, 6.7% ABV. Pale Ale - English, 5% ABV. Stout - Russian Imperial, 9.5% ABV, Collaboration with La Quince Brewery. Pilsner, 4.8% ABV, Collaboration with Kings County Brewers Collective . IPA - Milkshake, 6.5% ABV. Stout - Milk / Sweet, 4.7% ABV. IPA - Session / India Session Ale, 4.9% ABV. Porter - American, 6% ABV. Pale Ale - International, 5.3% ABV. Porter - Imperial / Double, 11.4% ABV. IPA - American, 6.7% ABV. Saison / Farmhouse Ale, 6% ABV. Lambic - Gueuze, 7% ABV. Stout - Russian Imperial, 10.4% ABV. IPA - Session / India Session Ale, 4% ABV. Stout - Imperial / Double, 11% ABV. IPA - International, 7.1% ABV. Brown Ale - English, 5% ABV. Red Ale - American Amber / Red, 5% ABV. IPA - American, 6.8% ABV. cerveza artesanal, Stout - Coffee. IPA - Imperial / Double, 8.5% ABV. IPA - New England, 6% ABV.